Coffee and Walnut Sponge Cake – Create, Make & Bake! Yesterday was my grandad’s birthday, I don’t think I can state how old, don’t know if I can count that high (that’s not necessarily an insult to him). But yeah, I free styled this one so if anyone dies, I am fully responsible, sowwy. Oh yeah and I found this weird flower thing at a shop for £1, so yeah that was pretty good. 1. In a large bowl, beat the butter until your arm doesn’t break trying to soften it, then add all the sugar and cream it until completely combined. 2. Add one egg and 1/6 (53/54g) of the flour to the butter mix, mix until combined and repeat until there the eggs and flour are all used. Mix in the baking powder (don’t over mix). 3. Split 1/3 of the mixture into a separate bowl, in another small bowl or jug or something that can hold water, use your hands for all I care, but you might need to grow a third hand to mix and a fourth to treat the inevitable scalds , mix the water and coffee together until completely dissolved, leave to cool for a minutes, or else you might accidentally cook the mixture slightly. After its relatively cool, pour into the 1/3 of separated mixture and add the cocoa powder, mix well but don’t over mix. Preheat oven to gasmark 4-5/180-190*C/360-380*F, grease cake tin(s). 4. In the original mixture, add in the vanilla and walnuts, add as much milk so that the consistency is the same and the coffee mixture. 5. Bake half the walnut mixture in the prepared tin for about 20 minutes or until an inserted skewer comes out clean, repeat with the coffee mixture, then the rest of the walnut mixture. Leave to cool. 6. For the filling, mix the water and coffee granules together in the preferred water-holding object, you can add a lil extra or less coffee if you prefer. 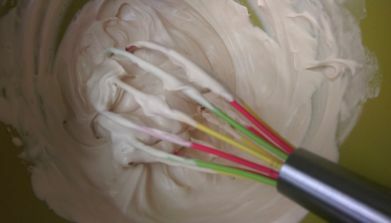 In another bowl, mixture the cream and icing sugar, add in the coffee water and whisk until it doesn’t drop from the whisk (picture). 7. Put a layer of cream on the first walnut cake, place the coffee one on top and cover that layer as well, layer the third piece on top of that. If there’s extra, decorate as you want, or eat it, eating is preferable I have found.